Originally built in the Nanzhao Kingdom (738 - 902), Yuantong Temple is the largest and oldest Buddhist temple in Kunming. Close to Kunming Zoo, it is located at the southern foot of Yuantong Mountain. The temple is back dropped by Yuantong Mountain. It features old exquisite buildings. The temple is a fusion of Han Buddhism, Tibetan Buddhism and Southern Buddhism genres from Southeast Asia. Yuantong Temple is composed of Buddhist halls of Mahayana Buddhism (also known as the Northern Buddhism), the Theravada Buddhism and the Tibetan Buddhism (also known as the Lamaism). You could explore the three types of Buddhist halls at the one temple. Yuantong Temple features Yuantong Hall, Bajiao Pavilion and the only existing Copper Buddha Hall – the hall of the Theravada Buddhism. The sitting statue of Sakyamuni at the Copper Buddha Hall is 3.5 meter tall with a weight of 4 tons. There are four colorful paintings in the Copper Buddha Hall. The four paintings demonstrate Sakyamuni’s birth, enlightenment, his very first teaching, and Nirvana, respectively. Behind the Copper Buddha Hall, you will find many old stone inscriptions. As an architecture with double eaves in Xieshan Style, the Yuantong Hall is in the Qing Dynasty (1644 - 1912) style. There are many Buddha statues in the hall, which are arranged in accordance with the rules of the Daxiong Hall. Two dragon pillars stand on both sides of the main Buddha. Caved with green and yellow dragons, the pillars are 10 meters tall. Buddhist Buddhas, Bodhisattva, arhats and Taoist monks are situated in the one hall together. Although the Hall of Tibetan Buddhism is simple, it is very symbolic. In the middle of the hall is the Buddha of Sakyamuni. The leader of the Gelug School of Tibetan Buddhism, Tsongkhapa stands on the right while the founder of the Nyingma School of Tibetan Buddhism (Red Religion) is situated on the left. If you are planning to visit the temple for photography purposes, the best time to visit is during the sunset. When it is on the lunar 1st and 15th, the Dharma assembly is regularly held in the temple. If interested to know more about the three schools of the Buddhism, you could visit the temple that day. Bus 4 and Bus 59 pass by the temple. Therefore, you could rent a vehicle to the temple or take Bus 4 and Bus 59 to the Stop of Yuantong Mountain (圆通山站). Please keep quiet at the temple. If you are interested to take pictures of the Dharma assembly held on the lunar 1st and 15th, it is not recommended that you take pictures so close. The vegetarian lunch at the temple is popular among locals and visitors. Interested in visiting the Yuantong Temple on a Tour? 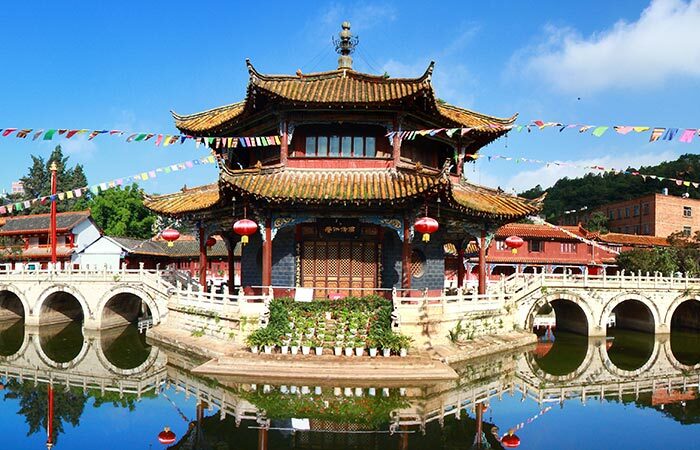 Wendy Wei Tours offers a variety of different packaged tours as well as custom tours including the Yuantong Temple, among other attractions and destinations. To find out more, please visit our Tours page or Contact Us directly to find out more.